By an exclusive flight enjoy the free route choice. On a flight in the group the local attractions are overflown. The route is dependent on the weather and of course aviation safety, otherwise the pilot attempts to fulfill your wishes in compliance with the flight time. 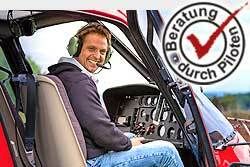 Outside this dates you have to pay a additional pilots rate of € 400,-.